The epiglottis is a cartilaginous flap covering the opening of the windpipe during swallowing to prevent food from entering the lungs . The flat, leaf-like structure is attached to the superior end of the larynx (voice box), protruding into the pharynx, just behind the root of the tongue, in its relaxed state . Visible around the 5th week of fetal development, the elastic cartilage flap originates from the fourth pharyngeal arch. Its lingual surface is covered by mucus membrane , with the anterior surface consisting of non-keratinized stratified squamous epithelium, similar to the mouth and pharynx tissues, while the posterior surface is covered in pseudostratified columnar epithelium, similar to the tissues that line the larynx . The epiglottis is visible from the outside, posterior to the tongue, appearing like a flat flap, beneath the uvula. 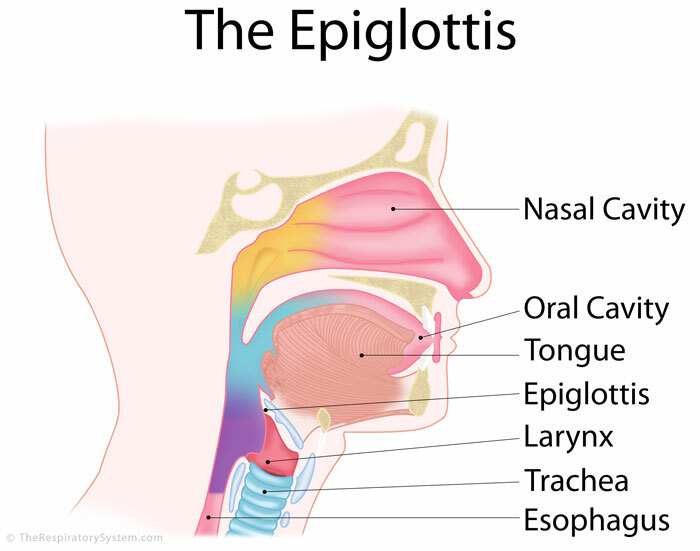 Sometimes, the epiglottis may be high-rising and elongated, but it is completely harmless, only more visible from the outside when the mouth is open . It is usually seen in children, but may be detected in adults as well. When the epiglottis is in the resting position, it is held by the thyroepiglottic and the hyoepiglottic ligaments. 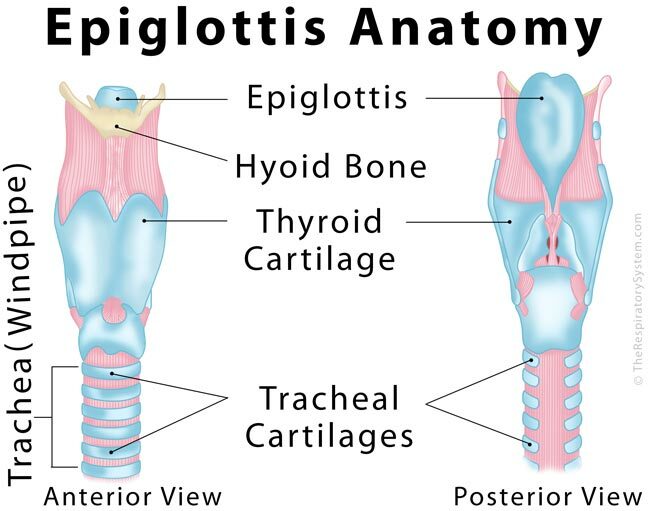 The inferior part of the epiglottis is connected to the thyroid cartilage by the thin, small thyroepiglottic ligament, while the tiny hyoepiglottic ligament serves as a connection between the superior region’s front surface and the hyoid bone . 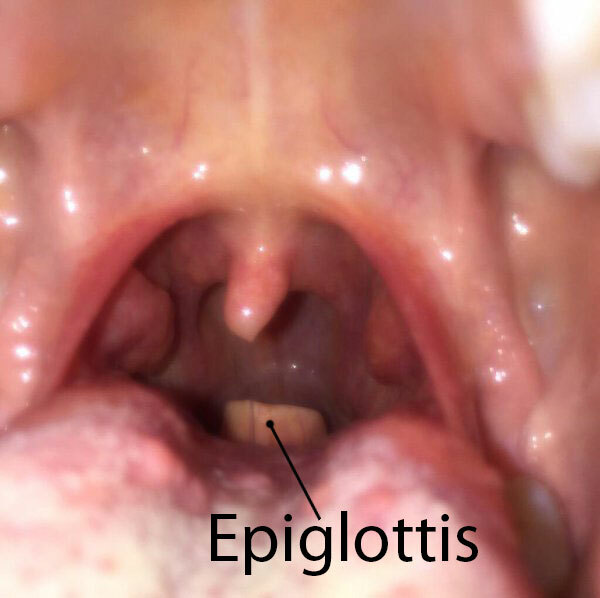 The median glossoepiglottic folds attach the epiglottis to the tongue , while the lateral glossoepiglottic folds connect it to the pharynx  and the aryepiglottic folds attach its sides to the arytenoid cartilages . The depressions, between the surface of the epiglottis adjacent to the tongue and the root of the tongue, on the two sides of the median glossoepiglottic fold, are known as the vallecula. There are some taste buds on the epiglottis, innervated by vagus nerve fibers form the inferior ganglion . The flexible flap remains in its resting position during inhalation, letting the air enter the lungs through the larynx and windpipe. During the process of swallowing, the extrinsic muscles connected with the larynx move the epiglottis up so it can lay flat over the laryngeal opening, making the food safely pass through the esophagus, instead of entering the windpipe. Afterwards, the muscles relax, so the epiglottis can come back to its original position . If it malfunctions or fails to close properly, it would make you cough and choke every time you swallow. The cartilaginous structure also helps with speech production in some languages . Epiglottitis (Swollen Epiglottis): A rare, yet potentially life-threatening condition, occurring due to some infection or injury, epiglottitis is characterized by swelling, redness, and inflammation of the epiglottis, which may block the airflow to your lungs . Common symptoms include hoarseness of voice and pain during swallowing . It is more common among children, often caused by the bacteria Haemophilus influenzae type b . So, newborns are vaccinated to prevent the infection. Severe cases may even need an intubation to avoid long-term problems . 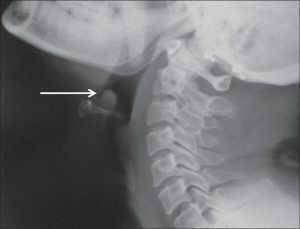 An Omega Shaped Epiglottis: Often a characteristic sign of a condition called laryngomalacia, it refers to an abnormal curled up shape of the epiglottis that may cause problems during inhalation . Laryngomalacia, one of the common causes of noisy breathing among infants, is a congenital malformation where the laryngeal tissues are soft and floppy, collapsing over the airway during breathing. 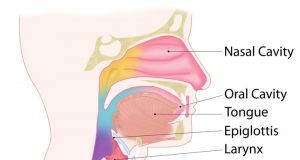 Cancers Affecting the Area: The epiglottis may be severely affected by head and neck cancer, as well as malignancies of the throat, pharynx, larynx, and supraglottis. In such cases, an epiglottic reconstruction surgery may be carried out to prevent abnormal swallowing and aspiration of food in the lungs. i feel like my epiglottis is swollen. i dont have the symptoms of epiglottitis. when i lie down i feel the sensation of that area closing off and i cant breathe through my nose. it does feel a little irritated and i have a little harsh cough.